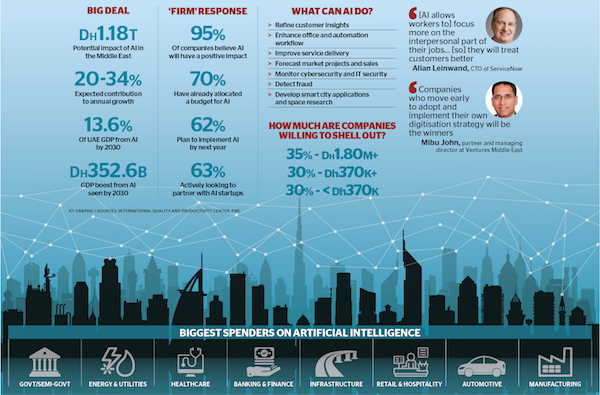 Middle East entities, especially in the UAE and Saudi Arabia, are increasingly streamlining their strategies with artificial intelligence as they see its advantages, which would allow them to keep in step with each other and better respond to the changing needs of their customers, among other critical reasons. And companies in the region are increasingly becoming aware of the benefits the increasingly-popular technology will bring. According to a new study from the International Quality and Productivity Center (IQPC), an overwhelming 95 per cent believe that AI will have a positive impact on their firm, with 70 per cent already earmarking a budget for its implementation. Sixty-two per cent plan to implement AI on their systems next year, while 63 per cent are actively hunting for AI startups to partner with. Going further on budgets, 35 per cent of respondents said that they were willing to shell out $500,000 or more (Dh1.84 million and above) for this endeavour. Thirty per cent say that they would spend $100,000 or more (Dh367,325) - the same percentage for those that would reserve less than that same amount. "The idea behind AI is to create more satisfied customers," Allan Leinwand, CTO of ServiceNow, said in a separate report. "Because workers can focus more on the interpersonal and creative parts of their jobs rather than the more mundane, they will treat customers better." Leinwand quoted a recent PwC study that shows AI is expected to account for about 13.6 per cent of UAE GDP by 2030. The figure shows the importance AI will play in the future, especially in a fast-paced economy like the UAE. The report further notes that AI could have a potential impact of $320 billion (Dh1.18 trillion) in the Middle East, with its contribution to annual growth expected in the 20-34 per cent range. When it comes to which AI applications companies are most interested in, the IQPC says that data analytics was No.1 with 25 per cent, followed by machine learning (20 per cent), deep learning (18 per cent), chatbots (12 per cent), natural language processing (10 per cent) and cybersecurity (7 per cent). An interesting metric revealed by the report showed a varying degree to which units of an enterprise should be responsible in implementing AI. IT departments were tops at 27 per cent, followed by innovation/R&D with 22 per cent. Teams from strategy, operations and digital came in next with 18 per cent, 15 per cent and 13 per cent, respectively, while 5 per cent said that 'all' should implement AI. In terms of spending for AI implementation, government and semi-government entities came in at No.1, followed by - in order - energy and utilities; healthcare; banking and financial services; construction and infrastructure; retail and hospitality; automotive; and manufacturing. "There is no stopping the megatrend towards digitisation," Mibu John, partner and managing director at Ventures Middle East, wrote in a piece on the construction industry. "Companies who move early to adopt and implement their own digitisation strategy will be the winners." It is no secret that AI has the potential to offer positive change within companies. According to the IQPC report, among the impacts seen - depending largely on which industry they are in - are refining customer insights; enhancing office automation and workflow; improving service delivery; forecasting market projects and sales; monitoring cybersecurity and IT security; detecting fraud; and developing smart city applications and space research. "Regional CEOs understand that modernising IT infrastructure can deliver a competitive advantage," said Savitha Bhaskar, COO of Condo Protego. "Modernised IT can lead to real-time insights for better customer and citizen management, new revenue streams and greater efficiency and data protection." Conversely - and with any innovation - there are challenges enterprises are facing. Asked what's stopping them from 'taking the first step towards AI', four reasons given were interoperability with existing systems, identifying the right partners, data infrastructure and security.